While San Francisco is living the ramen dream with multiple options strong and weak to choose from, my hometown of Vancouver, BC is still in the early stages of a full Ramen Invasion. There are a few choices but not a lot and as proof a recent “Best Ramen in Vancouver” article listed only four options as “the best”, not even a Top 5 list. But in my research for where to get a bowl while visiting over the Christmas, every article had Hida Takayama on their list in one of the top positions. This place is clearly considered one of the best in the city. Upon further reading, it’s clear that this is one of the only joints in town that makes its noodles in-house, apparently a rarity in Vancouver. Well count me in, I want to try some in-house noodles!!! Hidden in upper corner of the Robson Public Market, located in the “west end” of Downtown Vancouver, I was a little surprised to find that Hida Takayama was actually an outlet in a food court but it was the only outlet that had a line and that’s usually a good sign. I went for the Shio Ramen which describes itself as the “ramen to try that proves the chef’s skills and technique”, wow, bold claims son! Lets see what we get!!! I was shocked at the large bowl that was presented and even more shocked at the steak-sized pieces of pork chashu within the bowl. The chashu was quite unwieldy and awkward but it sure tasted good. Otherwise, the bowl was quite barren, a piece of Nori, some bamboo and a smattering of green onions. No egg though… NO EGG… it wasn’t even an option to order on the side. Tough as I do love my egg in my ramen. I bet with the broth, I wouldn’t even need the egg! Alas, I would have lost that bet. 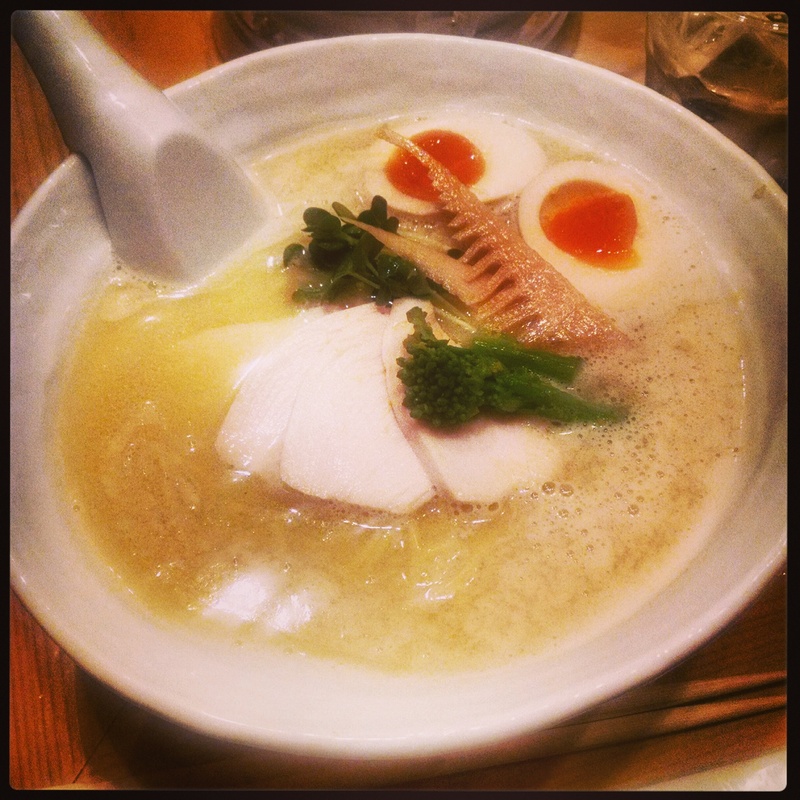 The broth was very delicate and uncomplicated but lacking in complexity and depth. 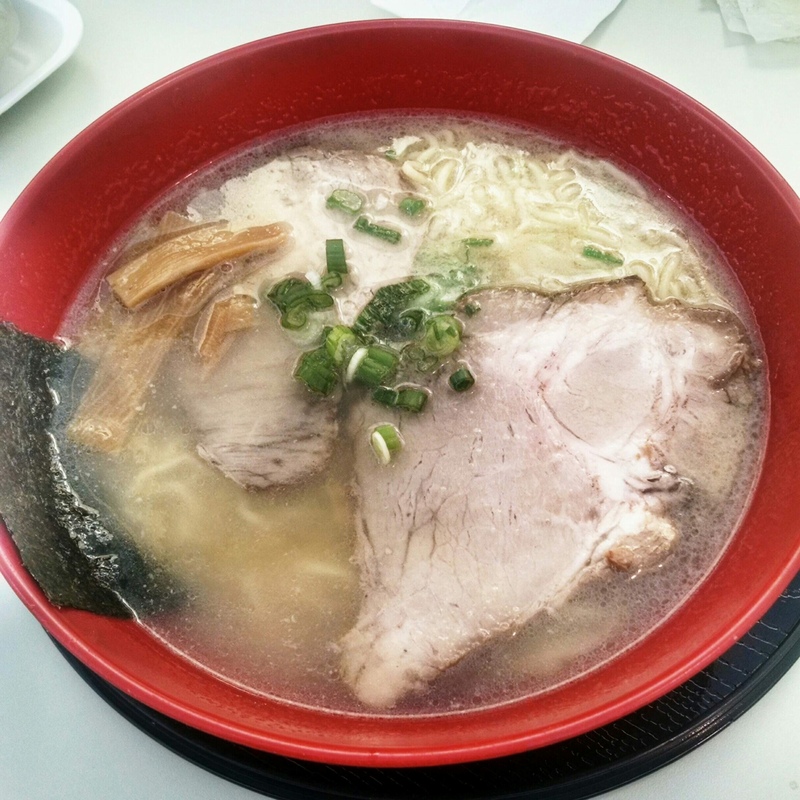 The flavor did not linger on the palette, it was extremely light missing the richness and full flavor that a pork-based ramen traditionally delivers. Without the egg or spice or corn, it was substantially lacking. The chef said that this would prove their skill and technique, well if the goal was to create a minimally flavored broth, they succeeded. I don’t need to have a bold broth with every meal but I expect my palette to be taken on a journey, here, the journey never got going. On a plus side, the in-house noodles were enjoyable, I just wish I had a more robust flavored broth to enjoy them in. Now, Hida Takayama offers a White Sesame Ramen, a Spicy Ramen and other unique options so I cannot denounce the establishment as a whole but I was quite disappointed with my bowl of Shio Ramen. The delicately light broth, the lack of egg, monster hunks of pork and little else… I was not the biggest fan of this ramen! I think I would try another ramen place in Vancouver before venturing back to Hida despite the other ramen options available, I really wanted to enjoy my bowl but I was left wanting a lot more. Chicken Ramen? Really? Well I was back in Tokyo and this is where I was introduced to Cheese Ramen and Burnt Miso Ramen so why not, let’s give Chicken Ramen a try. My co-worker Nick had eaten here before and to this day, he still talks about Kagari and to him, his all time favorite Ramen, the Chicken Ramen. All he said was “try it but be prepared to wait”. So with that in mind, Brad (my Japanese Ramen partner-in-crime) and I went to the immense shopping district of Ginza to find our prize. Kagari is located on a side street next to the giant Apple Store, all you have to do is look for the line-up. Tucked into an alleyway is a line of people waiting to get into this tiny “blink-and-you-will-miss-it” restaurant with no singage other that a small illuminated SOBA sign. We were the 20th people in line, even at 9:15pm so we discussed games and comics and laughed until about 20 minutes later when a friendly cook came by to take our orders. We both ordered the Tori Paitan Soba Ramen with the soft-boiled Seasoned Egg, in other words, the infamous Chicken Ramen. The menu says: “Concentrated Chicken Soup noodles. The soup is creamy with rich taste. Topping with Chicken Breast meat and seasonal vegetables”. Sounds very interesting. 25 minutes later when we finally got into the restaurant, we were greeted with six seats in a U-shape with an open kitchen in the back, awesome! No wonder there was a line-up! Within a minute of sitting, we had our bowls presented to us and… wow. Not only was this one of the most unique looking bowls but that smell son! That smell!!! How heavenly, in all my bowls of Ramen I had not smelled something as tantalizing as this. First off the look: a pale, creamy broth filled with homemade noodles, thinly sliced, absolutely fresh chicken breast, flavorful bamboo and crisp broccoli. The smell: like what you think chicken soup should smell like in your imagination, robust & mouth-watering. Finally, the taste: rich, soothing, complex yet unrefined. This was truly an amazing bowl of flavorful soup, I did not want it to end! It was like drinking velvet it was so good. Brad and I hardly said a word while we dined on this meal, other than the odd grunt of bliss from this absolutely stunning bowl of Ramen. Within 20 minutes we were done, satisfied and content with plastered smiles on our faces. This was a fantastic meal. I must thank Nick for recommending Kagari and this delightful Tori Paitan Soba “Chicken” Ramen, it’s one of the most original and flavorful bowls of ramen I’ve had in my life. Historically, Chicken Ramen actually was actually a popular thing before Pork Tonkotsu set the Ramen world on fire, now it’s harder to find but thanks to amazing bowls like this, Chicken Ramen is making a comeback in a big, big way! I will always remember this!